BEST SELLER | Zara by Jon Renau is a long wig, a layered and natural looking hair style with softly feathered ends. If you’re looking for a wig with a lot of length, Zara is the one for you! This flirty and feminine style features a monofilament top and ready-to-wear SmartLace™ front. These features create a natural looking hairline and the appearance of natural hair growth. The ready-to-wear synthetic hair looks and feels like natural hair. The open wefting in the cap creates better air ventilation, which provides more coolness on the scalp. It’s breathable and lightweight for a more comfortable fit. Jon Renau Zara can be worn up or down and gives you the length you've always wanted. Watch our Zara video and read customer wig reviews below! Jon Renau Zara wig is also available in a large cap size. SmartLace Front – Virtually undetectable sheer lace front that gives you a natural looking hairline and amazing off-the-face styling versatility. 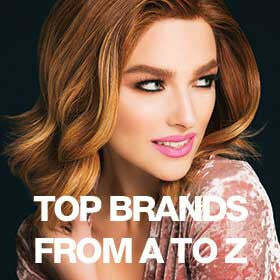 Stop wondering how to repair damaged hair.. and give your bio-hair a break with Zara! Approximate Length: Front 11.5" | Crown 17" | Sides 16.5" | Nape 15.5"